In reviewing this book, I’m a little worried that I am setting a dangerous precedent that I always review awesome books that Taryn recommends to me. Needless to say, as many good books as she sends my way, I’d be signing myself up for a bit more work than I have time for. Well, more work than I have time for without it cutting into my computer-nerd time. But in spite of that underlying worry, The Three-Body Problem is too good to not recommend. Written by Chinese phenom Liu Cixin, it was initially released in 2008 but only translated to English and released stateside in the last year. Somehow, it combines, history, hard science fiction, and mystery in the best way. I went in to the book fairly cold, but I think a bit of info can be given without ruining the mystery. The story starts out following scientist Ye Wenjie throughout the late 60s during the Chinese Cultural Revolution. Admittedly, it wasn’t until later in the book before the significance of this early story became evident, but it was interesting nevertheless. To call my knowledge around the revolution in China sparse would be rather generous. It was eye opening seeing that time of upheaval from the perspective of a local. Later in the book we follow applied physicist Wang Miao in the present day. When we first meet him, his presence has been requested at a secret meeting with a number of military bigwigs. Scientists, particularly highly theoretical physicists, are committing suicide at alarming rates and it is believed that Wang can help determine why. Interested? I sure as hell was. The early section where Wang is initially investigating the big ol’ pile of crazy that he’s gotten himself into is fantastic. Not knowing where exactly the book was headed was the best part. And when the early storyline finally started to tie in…Awesomeness. Reading translated novels isn’t always the easiest for me. I don’t know if it’s the differing writing styles, the uncommon names, or just my unavoidable American-centric view that makes it so, but it’s worth struggling through. This book took twists and turns I wasn’t expecting and did it with style. If you love hard science fiction, particularly the kind that says “oh crap, humanity is screwed,” this book is for you. 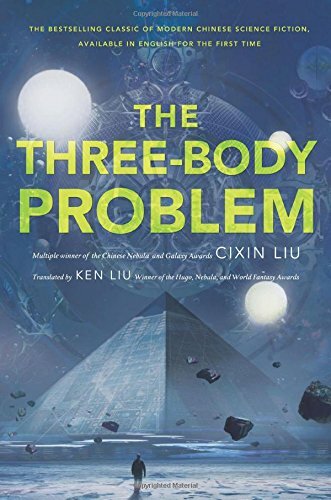 The Three-Body Problem is the first in the Three-Body trilogy. It will be followed by The Dark Forest later this summer and Death’s End in April 2016.